6. Messi became the third youngest player when he played for Barcelona at the age of 17, a match against Mataro at the Miniestadi. What’s more, he is also the youngest player to score for Barcelona. 7. Messi had impressed Barcelona to the extent that they were ready to take care of his medical expenses, move him with his family to Spain and sign him when he was just 13. 8. Carles Rexach was so impressed, the sporting director of Barcelona, with his game that he wanted him to play for Barcelona. Messi’s family asked him for a paper to confirm the deal so they could be confident about his signing for Barcelona. But as there was no paper available except napkin. 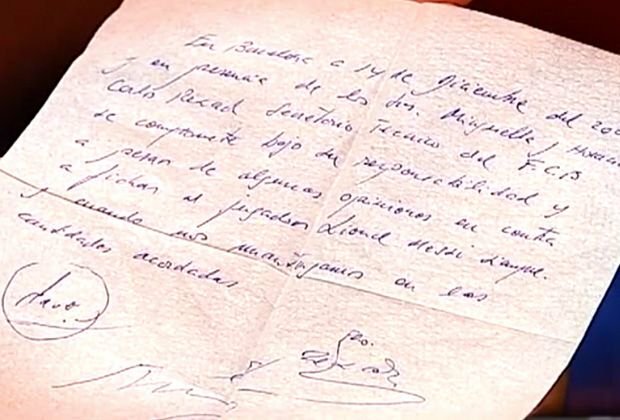 So Messi’s first contract was signed on a paper napkin. 9. Messi’s first ink on his dominant leg came after his son Thiago was born in 2012. Tattoo on his calf shows his son’s name as well as hand prints. 10. During his childhood, he suffered from growth hormone deficiency which stopped his normal growth at the age of 11. Enter your email address to subscribe to crypto recommendations and receive notifications of new posts by email.